Seismicity Monitoring in Mines based on Distributed Acoustic Sensing | Silixa Ltd. Many mines feature permanent systems for the monitoring of natural and induced seismicity. A variety of monitoring technologies are available depending on the mine layout and the information of interest, but in general such systems may involve the continuous use of a one or several geophones for the measurement of statistically anomalous disturbances. The sophistication with which these disturbances are reported varies with the intended use for the system, from very basic (documentation of approximate magnitude and time of day) to the more advanced (waveform capture, plus some post processing to estimate source position or other information). iDAS™ technology makes it possible to monitor seismicity with a wide aperture using lightweight, easy-to-deploy sensing hardware. 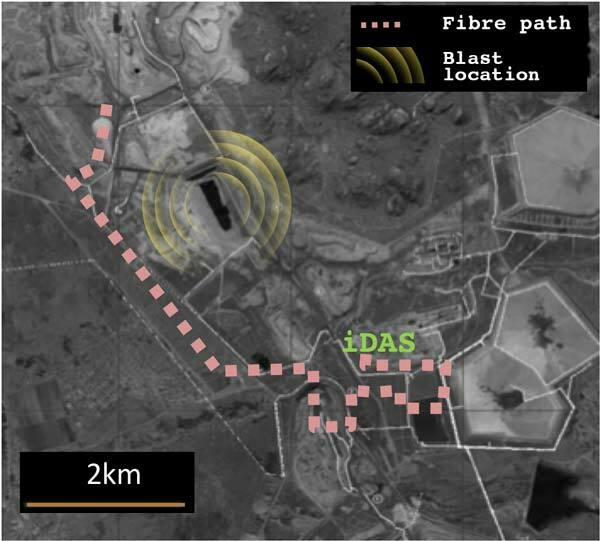 Trials now under way are exploring ways in which this technology can be used to reduce downtime in longwall operations, and improve on-the-fly understanding of blast operations. In one example, a blast has been observed at an Anglo American has site using an optical network which had been installed for telecommunications purposes. The outcome from that pilot, below, shows that it is possible to use this type of layout to obtain detailed information concerning spatio-temporal blast characteristics, even in the absence of any effort to develop specific zones for seismic-specific coupling.